Question: What do you get when you cross the genes of mechanical engineer with that of a long-distance athlete? No, the answer is NOT “Robocop”. Nor is it “the latest research experiment faked by Hwang Woo-suk.” Rather, you get: an endurance junkie who records a scary amount of completely useless data! Actually, in my case, I am merely a mileage maniac. Over the years I have noted how many miles I biked/ran/hiked/swam—and sometimes the elapsed time of the workout—and left it at that. My data recording was done in a rather ad hoc, carefree manner, which, not so coincidentally, is kind of how my training was. What their heart rate is the moment they wake up (presumably to verify that, yes, they are still alive). How many pounds they weigh in the morning, naked. How many mols of nitrogen, oxygen, and carbon dioxide consumed and methane expelled. Ok, I made the last one up. But I have no doubt that one day in the future, serious athletes will be able to take those measurements, joy. Anyhow, my point is not that I intend to document such minutia; indeed, I am still at Step 1. Which is: where to record this data. In the past I jotted down bits of numbers and verbiage in multiple places, including grid paper (archaic), Microsoft Excel, Palm Desktop, iCal, and (for long events) blog entries. This is like the office mate with post-it notes all over his desk, computer monitor, and cubical walls in addition to using a Palm PDA and laptop for his scheduling. No more. This is the 21st century after all, where anyone should be able to access his or her data anytime, from anywhere, on any computing platform. Or at least hackers could. 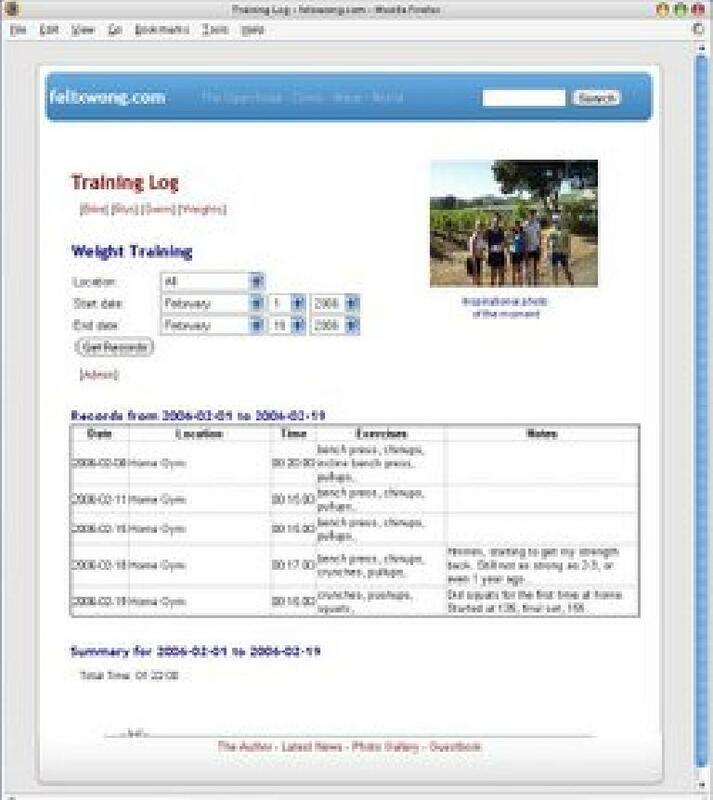 In any case, a single online training log was in order. 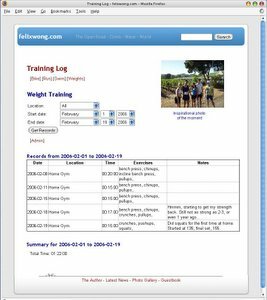 Now, there are plenty of online training logs readily available out there, for free. Some of them include Progress Log, Beginner Triathlete, Bike Journal, and my friend Lisa’s favorite, Running Ahead. However, none of these options were quite geeky enough for me. I wanted to have complete control over the database, including data importation and manipulation. Therefore, I spent a couple of days coding my own script. It is still in beta, but useable in the meantime. Right now (as of 2/20/06) it has entries for cycling, running, swimming, and weight lifting. My historical data for running, swimming, and weight lifting is spotty, but complete for cycling (all the way back to 1994)! Soon I will be adding log functionality for rock climbing and yoga. There are a number of features I plan on incorporating in the future, including a calendar view and listing the specific details of the weight lifting workouts. Now if I could only find a commercial application for obscure statistics such as “my Cannondale road bike has been ridden exactly 26,461.25 miles as of February 20, 2006.” Perhaps I should give Dr. Hwang Woo-suk a call. His proteges could probably use those numbers in their scientific articles. View my training log here. Update 11/10/06: Added rock climbing section to the training log. Tried to retroactively add data, but unfortunately am lacking all data from climbing with Kristina regularly in 2001 at Planet Granite Santa Clara, when I really improved.